Japanese swords are often perceived to be formidable and inaccessible objects that some people find objectionable or even abhorrent and it cannot be denied that from the time they began to take their final form at the end of the Heian period 平安時代 and through the ensuing Kamakura 鎌倉時代, Nanbokuchô 南北朝時代, Muromachi 室町時代 and Edo 江戸時代 periods that Japanese swords were consistently considered to be fighting weapons. It is however, the fact that sword makers never considered their swords simply as weapons is what separates Japanese swords from those made in other countries. Not only did the sword makers pursue perfection in a sword’s practical function as a weapon, they also pursued the sword’s artistic beauty. This is the Japanese sword. The Japanese people have traditionally expected objects to have artistic beauty in addition to practical excellence and the pursuit of beauty in all spheres of activity has always been inherent in their nature. Iron is a material with a shiny and cold quality but the Japanese were able to give it life and make it bloom as an artistic object. If you visit the Wallace Collection at one of London’s Museums where swords from all over the world are on display, you will find that the Japanese sword is the only one kind showing “life” in the iron material. What you can see in the Japanese sword is the delicate Japanese sensitivity nurtured by natural elements that change in accordance with the distinctive four seasons. It can be said that Japanese sword makers are not only craftsmen but also artists blessed with spiritual inspiration. In this respect, the workplace must be kept sacred, and they perform a solemn ritual to purify their bodies with cold water and prayers before setting out to forge iron. Why the Japanese sword is artistically recognized? The beauty of the Japanese sword comprises three major elements, Sugata 姿 (overall structure or shape), Jigane 地鉄 (grain structure or shape), and Hamon 刃文 (temper pattern along the cutting edge). It is thought that the blade structure incorporating the Sori 反り (curvature) and the Shinogi 鎬 (the longitudinal ridge) was developed from after the middle to the end of the Heian period 平安時代. Swords produced prior to that time, referred to as Chokutô 直刀, were made without curvature, in the so-called continental style and rather than a central ridge they had a flat surface in the so-called Hira-zukuri 平造 or Kiriha-zukuri 切刃造 style. From the mid Heian period 平安時代中期 a Shinogi 鎬 (ridge) was incorporated into the sword. The ridge runs lengthwise between the Ha 刃 (cutting edge) and the Mune 棟 (back) and divides the blades surface in about a 2 to 1 proportion. At the same time, Sori 反り (curvature) emerged and established the basic structure of the Japanese sword. Changing battle style throughout different periods resulted in subtle changes to the Sori 反り. By observing the shape and characteristics of a sword it is possible to determine approximately when it was made. Even though the shape of the blade changed with changing battle styles, the Japanese consistently pursued beauty in the sword’s appearance. Japanese aesthetics focus on curving rather than straight lines. Stone hedges, roofs of old Japanese castle Donjons 天守 and Torii 鳥居 gates leading to shrines all incorporate curves. This is evidence that the Japanese people traditionally cherished aesthetics focused on curvature. Forging iron using a folding process repeated 100 times results in the formation of various grain structures such as Itame 板目 (wood grain), Mokume 杢目 (burl grain) and Masame 柾目 (straight grain). The grain density can either be fine or coarse and polishing the iron results in different elements. In Japanese sword history, Kotô 古刀 (old sword) and Shintô 新刀 (new sword) refer to the period a sword was made. Kotô 古刀 refers to swords produced before the end of the Muromachi period 室町時代 and those produced in the ensuing Momoyama 桃山時代 and Edo period 江戸時代 are collectively referred to as Shintô 新刀. During the Shintô 新刀 sword period, the development of the nationwide trade and transportation network lead to expanded commerce which allowed iron to be supplied to a much broader area. This resulted in swords being produced in areas where no iron was produced. This explains why the Jigane 地鉄 of swords from the Edo period 江戸時代 have almost uniform quality regardless of where they were produced. On the other hand, those produced in or prior to the Muromachi period 室町時代 show distinct Jigane 地鉄 characteristics because the iron used came exclusively from the limited local area where the sword makers were based. Swords are generally made of a relatively soft Shingane 心鉄 (core iron) surrounded by a much harder Kawagane 皮鉄 (skin iron). A bar of iron made from the above two types of iron is hammered and stretched until it takes a form of sword. The final step in the sword making process is Yaki-ire 焼入 (tempering) which greatly strengthens the sword. In this process, heat-resistant clay is applied to the blade surface. Clay on the cutting edge is thinner than what is applied to other areas. The coated sword is heated at between 800° to 1,000° Centigrade until it becomes a burning red color, and is then immediately immersed in cold water. While the cutting edge with the thinner clay coating cools off rapidly the thickly coated part takes more time to cool off. This results in the Ha 刃 (cutting edge) having a much harder quality and the Ji 地 (the rest of the sword) has a relatively softer quality. The way sword makers place the clay in the coating process results in various temper patterns referred to as Suguha 直刃 (straight), Gunome-midare 互の目乱 (zigzag), Chôji-midare 丁子乱 (clove-shaped), Tôran-midare 濤乱 (surging waves), and Sanbonsugi 三本杉 (three cedar trees). If a sword maker’s only objective was to make a sharp cutting edge, they simply needed to form a Suguha 直刃 (straight) temper pattern. But Japanese sword makers attempted to create various complex temper patterns in their works. They attempted to depict familiar natural scenes such as clouds in the sky, mountains, flowers, waves in the sea, etc. It is these temper patterns that prove that sword makers had an aesthetic consciousness towards their natural environment. The sword maker’s personal traits as well as the traditional school they belonged to can be learned by observing these temper patterns. When carefully directed, light strikes the blade surface, the temper pattern along the cutting edge becomes brilliantly clear. The line forming the temper pattern is called the Nioiguchi 匂口 and some are wide (Fukai 深い) while others are narrow (Shimaru 締まる). The brightness of the Nioiguchi 匂口 also varies. If it is not very bright it is termed Shizumu 沈む, and a clearly bright state is termed Saeru 冴える. Furthermore, a very intense chemical change during the tempering process forms differing grain structures containing marten sites and others. The grains formed in heat close to 1,000° Centigrade are relatively large and called Nie 沸. Works of the Sôshû 相州 school based in Kamakura 鎌倉 and represented by the very famous master sword maker Masamune 正宗 contain this type of Nie 沸 which is clearly visible to the human eye. On the contrary, another large school based in Bizen province 備前国 produced swords in a lower heat of around 750° ~ 800° Centigrade resulting in bringing forth very fine grains. The grains are so fine that they form something like a hazy Milky Way and are not discernible to the naked eye. Such fine grains are called Nioi 匂, and the temper line of that kind is described as Nioi-deki 匂出来. The overall blade structure is indicative of the time of production while the Jigane 地鉄 generally points to the location in Japan where the sword was produced. The temper pattern is indicative of the individual sword maker or of the school’s traits. Among the above three major elements (Sugata 姿, Jigane 地鉄 and Hamon 刃文), Hamon 刃文 is the most important aspect in appreciating and evaluating the quality of Japanese swords and it is this that requires the most careful attention. It warrants repeating that the Japanese sword is not simply a killing tool but that it has definite aesthetic qualities In an old picture scroll titled Matsuzaki Tenjin Engi Emaki 松崎天神縁起絵巻 (Founding History of the Matsuzaki Tenjin Shrine) painted in the 1st year of the Ôchô 應長 era (1311 ~ 1312 AD) a warrior is depicted holding and appreciating the beauty of his sword. This is evidence that the custom of appreciating the Japanese sword was already established as early as that time and it is also apparent that polishing is an important part of enabling appreciation of the Hamon 刃文 and the Jigane 地鉄. Good polishing is indispensable to bringing out the various grain structures in the sword. Polishing skills in the Kamakura period 鎌倉時代 were probably not as sophisticated as they are now, but it is likely that a certain level of polishing skills had already been attain at that time. Following the description on the aesthetic factors of the Japanese sword, the relationship between the Bushi 武士 (Samurai 侍) and the Katana 刀 (sword) need be explored. Bushi 武士 always wore Katana 刀, even when they were not in battle. Nippon-tô 日本刀 (Japanese swords) were the status symbol of the Bushi 武士 as well as a battle weapon. In fact, Katana 刀 was an inseparable part of the Samurai 侍. In the Edo period 江戸時代, when a Daimyô 大名 appointed by the Tokugawa Shôgunate 徳川幕府 to govern local territories retired or died, it was customary to present a masterpiece sword to the Tokugawa Shôgun 徳川将軍. And when a Daimyô 大名 was first appointed as a local governor by the Shôgunate 幕府, a congratulatory sword was presented by the Shôgun 将軍. In addition, when a Daimyô 大名 was consigned to work for the Shôgunate 幕府, for example, on renovation of the Shôgun’s 将軍 Nikkô Tôshôgû 日光東照宮 shrine or construction of major rivers, a sword was often presented to the Daimyô 大名 by the Shôgunate 幕府 as an recognition of the contribution. It was as if the Japanese sword was the most important and prestigious object that could be presented. There is yet another factor to the importance of the Japanese sword. When ancient burial tombs are excavated, swords are sometimes found among the buried objects. The three kinds of sacred object inherited in the Imperial lineage as symbols of the Emperor include a sword named Amanomurakumo no Tsurugi 天叢雲劔. Also in the famous Atsuta shrine 熱田神宮 in Nagoya 名古屋 there is the famous Kusanagi no Tsurugi 草薙劔. These legendary swords among others in similar situations are being enshrined as sacred objects. The fact that swords have been worshipped as objects of religious faith is a factor which should not be overlooked in understanding the nature of the Japanese sword. It is evident that Japanese sword is far beyond a simple weapon It encloses aesthetic, spiritual and religious significance inside its hard iron material. It is hoped that it is not simply a weapon, is now more clearly understood and recognized. The most outstanding characteristic of Nippon-tô 日本刀 is in the intensity of its curving line. 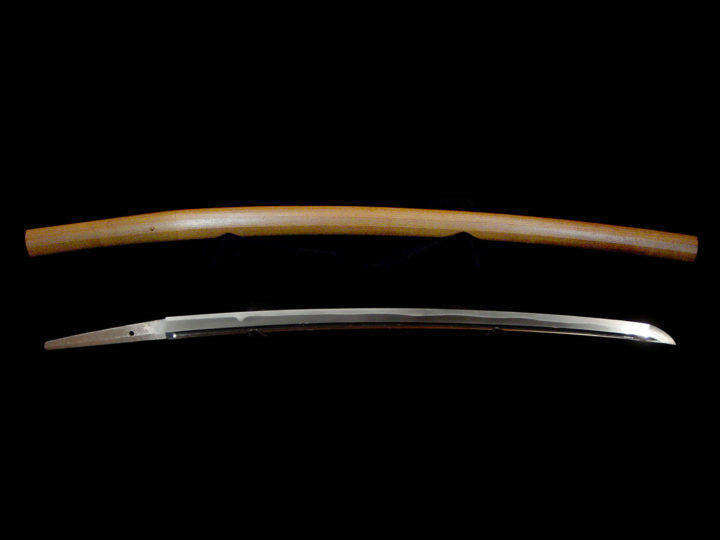 The beauty of the curvature is enhanced further by the unique Shinogi-zukuri 鎬造 style formed by the ridge running the length of the blade. This ridge between the Ha 刃 and the Mune 棟 (slightly closer to the Mune 棟) is an essential condition of the blade’s curvature, and together with a transverse ridge called Yokote 横手, forms a small triangular area called Kissaki 鋒先 at the very tip of the blade. The exact process of the curved sword’s creation is not yet clearly established, but it is generally accepted that the blade shape reached its final state around the middle of the Heian period 平安時代. The so-called Shohei 正平 and Tenkei 天慶 battles fought between the then two vying powers Taira 平and Fujiwara 藤原 in the early half of the 10th century is thought to have caused the drastic change in the blade shape. Swords made prior to then are called Jô-kotô 上古刀, and their straight shape was inherited from the Asian continent where the Japanese sword has its origin. Jô-kotô 上古刀 still in existence include the Heishi Shôrinken 丙子椒林剣 and Shichisei-ken 七星剣 which is believed to have belonged to Prince Shôtoku 聖徳太子, and the straight swords in Emperor Shômu’s 聖武天皇 Shôsôin 正倉院 collection dating back to the 8th century. A greater number of such swords were excavated from ancient burial mounds and it is likely that they are a mixture of both continent-made and domestically made products but clear differentiation is no longer possible. These Jô-kotô 上古刀 can be divided into three styles, Hira-zukuri 平造 (flat, ridgeless), Kiriha-zukuri 切刃造 (ridge placed close to the cutting edge), and Kissaki-moroba-zukuri 鋒先両刃造 (cutting edge on both sides). It is thought that the latter two types have a more advanced blade form. They are also referred to as Tachi 太刀 but use different Chinese characters to differentiate from the Tachi 太刀 produced in the later curved sword times. The change from straight swords to curved swords seems to have resulted from the changes in battle styles from infantry battles to mainly cavalry. Straight swords are convenient in thrusting while on foot, but not so when used from a mounted position. Experience must have shown that curved swords were more desirable in the new style of battle. To increase the sharpness and cutting efficiency of a sword, curvature innovation included the addition of a Shinogi 鎬 ridge to the ha in the Kiriha-zukuri 切刃造 style but then gradually moved closer to the Mune 棟 to finally make the Shinogi-zukuri 鎬造 structure. It is clear in the cross section of the cutting edge that the dull angle in the Kiriha-zukuri 切刃造 changed to a sharper angle, indicating that sharpness was largely increased. In the Shinogi-zukuri 鎬造, the ridge is placed between the ha and the Mune 棟 approx. in a 2 to 1 proportion closer to the Mune 棟. This is the best arrangement to create a well-balanced structure as well as the most beautifully proportioned curvature. 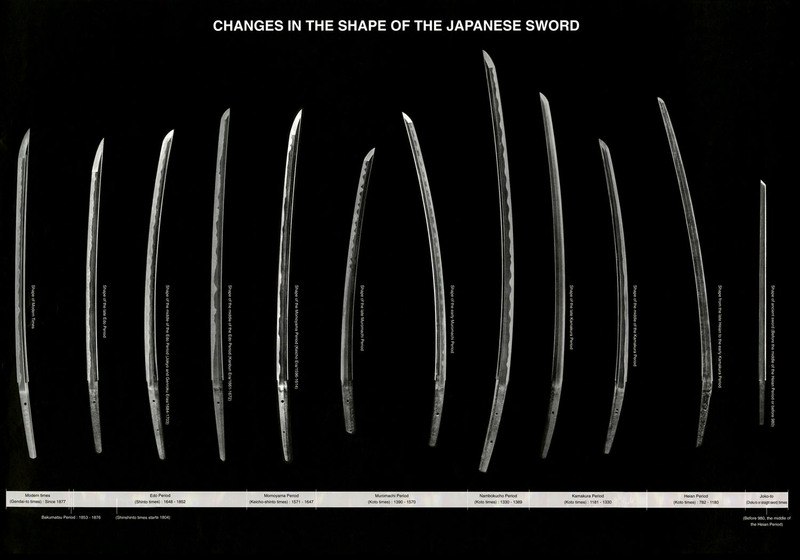 The changes from the straight to the curved sword resulted not only in enhancing the practical quality but also in increasing its aesthetic quality by improving the primitive straight form to a more sophisticated curved one in a manner most typical of Japanese aesthetics. This basic curved form of the Japanese sword was maintained over a long period of time, but the Sori 反り was never uniform and went through subtle modifications as the style and method of battle changed in later times. The following section describes the characteristics of Sugata 姿 and its changes reflecting the respective historical periods. The Tachi Sugata 姿 at this time was generally slim and had a pronounced Sori 反り (curvature) starting from the tang to the lower part of the sword placed near the hip when worn slung from the belt with the ha facing downward. Compared to the base width, there is an outstanding tapering towards the tip making the top width remarkably narrow. As a result, it has a very small Kissaki 鋒先 (point area). Such a form is called Koshizori 腰反り (curvature marked near the base). Starting from the middle of the sword, the curvature is formed as if it was pressed from the Mune 棟 side, and thus makes the sword look as if it forcefully rises in the upper part. Such a state of Sori 反り is called Utsumuku 俯く. There is a theory that such a form was innovated to maintain a sword’s thrusting function, but the exact reason is not known. The average length of swords at that time was about 75 ~ 78 cm. 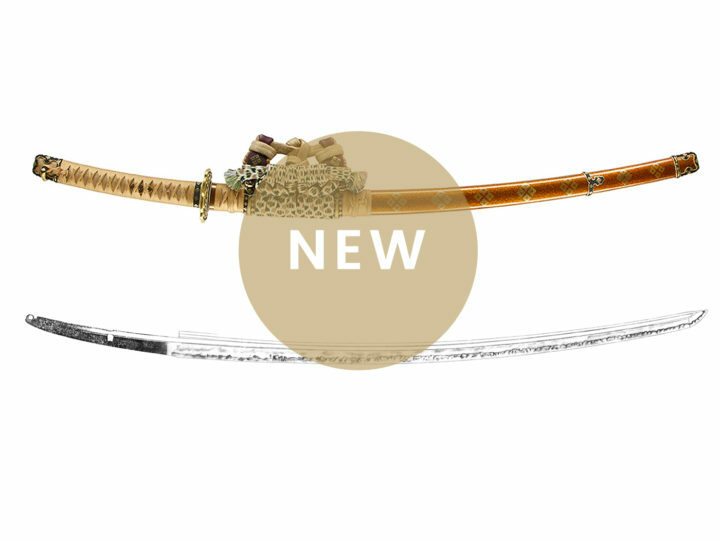 The Tachi 太刀 made during this period reflects the atmosphere of the aristocratic culture and had an elegant and dignified form designed to make treasure out of swords. The Hamon 刃文 is basically Suguha 直刃 (straight) mixed with small irregular patterns comprising small Chôji 丁子 and small Gunome 小互の目. The grains are relatively large, and presented in an unpretentious manner creating a simple and natural taste. The Tantô 短刀 (short sword) made during the Heian period 平安時代 probably had a very practical function and were considered disposable. Because of this there are few works remaining from that time. For some reason however, there are quite a few Tantô 短刀 remaining from the ensuing Kamakura period 鎌倉時代. This is a period when the Heian period’s 平安時代 aristocratic culture shifted to a warriors’ culture after the establishment of the Kamakura Shôgunate 鎌倉幕府. Warriors valued courage above all and preferred simple and disciplined lifestyles. Such a trend caused a change in the sword structure, from the conventional elegant and feminine style to a powerful, masculine style. The changes meant that the blade width showed less tapering and maintained the same, generally broad width towards the tip. The Sori 反り (curvature) continued to be Koshi-zori 腰反り, but unlike the Heian Tachi 平安太刀, it more or less maintained the same curving angle in the upper part of the blade. The point accordingly was considerably larger and had a stout shape looking like a wild boar’s neck (Ikubi-kissaki 猪首鋒先). The sword also became thicker and began to have a very powerful structure. As for the Hamon 刃文, gorgeous and spectacular Chôji-midare 丁子乱 (clove shaped) was favored as shown in the Tachi 太刀 made by the Fukuoka Ichimonji 福岡一文字 school in Bizen 備前 (Okayama 岡山), and the Rai 来 school in Yamashiro 山城 (Kyôto 京都). During this period, tempering and forging technologies achieved a remarkable improvement, and the strong aesthetic consciousness of the sword makers was evident in the Jigane 地鉄 and the Hamon 刃文 which obviously reflected the respective sword makers’ certain objectives. The Sugata 姿 either remained more or less the same with the style of the mid Kamakura period 鎌倉時代中期 or returned to the late Heian 平安時代末期 and / or early Kamakura’s鎌倉時代初期 slender structure. However, the degree of curving of the upper part of the Sori 反り increased. Works of the Bizen Osafune 備前長船 school often have Hamon 刃文 mainly consisting of the Suguha 直刃 (straight) containing Gunome 互の目 (zigzag), a type of Hamon 刃文 representing a new trend in this period. The most famous master sword maker Masamune 正宗 worked at this time in Sôshû Kamakura 相州鎌倉. He brought the quality of Nie 沸 grains to perfection, and his Sôshû 相州 style workmanship spread nationwide and enjoyed great popularity. Starting from this period, Tantô 短刀 (short sword) production increased greatly. Both the width and the length were ordinary or tended to be slightly smaller in dimension, and most of them were around 24 cm long. Hira-zukuri 平造 was most popular, and the Sori 反り takes the so-called Uchizori 内反り form with a slight stooping toward the cutting edge side. After the fall of the Kamakura Shôgunate 鎌倉幕府, a brief Imperial rule was soon disturbed by a struggle for sovereignty. The entire nation was split between the two powers upholding the Imperial families divided into the South and the North regimes, and the nation was at a state of constant war and political confusion. At the same time, threats from overseas starting in the preceding period, such as the Mongolian invasion, continued and consequently resulted in production of both large and long Tachi 太刀 and Tantô 短刀. The Tachi 太刀 was made long and wide, and had the most powerful structure. Some were longer than 90 cm and were worn on the back. They were all made thinner and sometimes had a Bô-hi 棒樋 (straight groove) engraved lengthwise to lessen the weight. These large Tachi 太刀 produced during this period were often shortened at some later time. They were turned into Uchi-gatana 打刀by cutting the Nakago 茎 (tang) short (Suriage 磨上) and therefore resulted in loosing the signature of the maker if there was one. The Tantô 短刀 were also made large in both the width and the length. Contrary to the style of the previous period when Tantô 短刀 had Uchi-zori 内反り, the Sori 反り was turned shallowly towards the Mune 棟 Their length was usually more than 30 cm. The Hamon 刃文 was often a large Notare-ba 湾刃 (spaciously undulating zigzag) to match the large size of the blade. A new and unique temper pattern Hitatsura 皆焼刃 (covering the whole blade surface) was also sometimes applied. The military power controlling this period moved the nation’s capital back to Kyôto 京都 and there arose a tendency to adore a culture nurtured by the court nobles. Production of large sword swords ceased, and the normal Tachi 太刀 style returned. In terms of Sori 反り, a marked curvature emphasized towards the point (Saki-zori 先反り) became a historical characteristic. In the Bizen 備前 schools, Chôji 丁子 (clove) was taken up again and mixed with Gunome 互の目 (zigzag) to form a very active Hamon 刃文. Combined with the Sugata 姿, there obviously was a reactionary towards the Kamakura period 鎌倉時代. At this time, the Uchi-gatana 打刀 (swords worn inserted in the waist sash with the cutting edge facing upward) came into existence along with the Tachi 太刀 as another form of long sword. After the two major battles referred to as Onin 應仁亂 and Bunmei 文明亂 no Ran spears became a more efficient form of weapon. Eventually, guns also came into battle scenes and man-to-man fighting tactics changed to large scale infantry operations. In large scale fighting, faster sword handling abilities were required. The relatively long Tachi 太刀 slung from the waist sash and requiring a troublesome pulling out action before taking a cutting action became inconvenient, and the demand declined. Replacing the Tachi 太刀 almost completely was the Uchi-gatana 打刀, which had begun to be used in the preceding period. Its length was not much more than 60 cm and the Sori 反り was far more outstanding towards the tip than at the base. Such a style of Sori 反り is called Saki-zori 先反り There is practically hardly any tapering of the blade width towards the point. The Nakago 茎 (tang) is made short to suit a one-hand handling. The Hamon 刃文 representative of this period were various Midare-ba 乱刃 (irregular patterns) consisting of Gunome 互の目 (zigzag). Sword makers based in different localities produced unique, characteristic patterns. For example, Yosozaemon Sukesada 与三左衛門祐定 in Bizen Osafune 備前長船 is known for the so-called Kani-tsume-ba 蟹爪刃 (crab-claw shaped) which consists of complex Gunome 互の目 combinations. Magoroku Kanemoto 孫六兼元in Mino Seki 美濃関 is known for Sanbonsugi 三本杉 consisting of a combination of pointed Gunome 互の目, and Muramasa 村正 in Ise Kuwana 伊勢桑名 created a pattern which was considered to be omen-spelled. This period was also called the Sengoku (warring states) period戦國時代. Incessant warfare taking place nationwide caused rapid consumption of Katana 刀 and resulted in the supply being incapable of meeting the demand. This consequently led to frequent mass production of inferior swords. Such products are called Kazu-uchi 数打者. However, there were also some well-made swords and these usually bear the maker’s signature and the date of making inscribed in the tang by the maker’s own hand. Such Katana 刀 are called Chûmon-uchi 注文打 (custom-made) to distinguish them from the Kazu-uchi 数打 swords. The nationwide state of war at long last ended with the rise of Oda Nobunaga 織田信長 who was succeeded by Toyotomi Hideyoshi 豊臣秀吉 and Tokugawa Ieyasu 徳川家康 who paved the way to national unification. The Katana 刀, just like paintings and architecture of this period, took a grandiose, gorgeous form, and gives an impression that the taste of the immediately preceding period was denied and was replaced by that of the Nanbokuchô period 南北朝時代. That is to say, the sword was made to originally have a shape of an Ô-suriage 大磨上 (largely shortened) sword with a broad width showing little tapering to form a large Kissaki 鋒先 at the point. The Sori 反り is shallow, and the overall blade structure is most powerful. The Hamon 刃文 which tended to be quite free and active gives a sense that the workmanship of the old Sôshû 相州 school in the Kamakura period 鎌倉時代 was being aimed for. During this period, many Tachi 太刀 made in the Kamakura 鎌倉時代 and Nanbokuchô periods 南北朝時代 were modified by cutting them short and making them into Uchi-gatana 打刀. It should be noted that the Katana 刀 made in the Keichô 慶長 era in this period and / or afterwards, are presently called Shintô 新刀, while the earlier works are called Kotô 古刀. 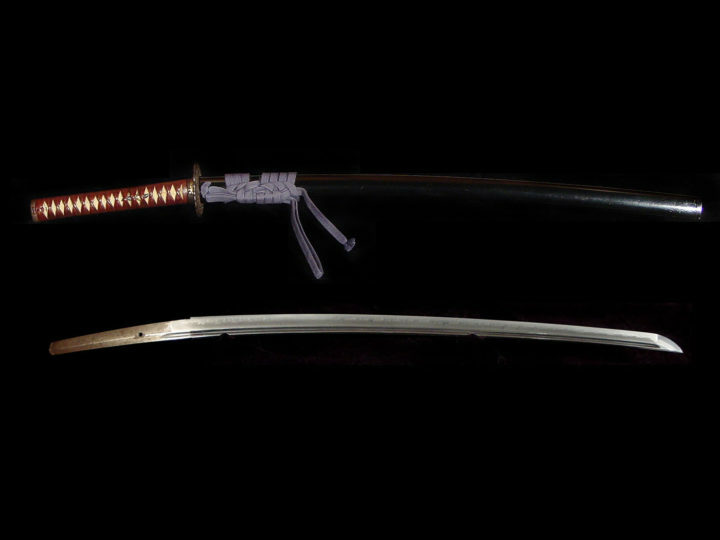 The Katana 刀 made during the Keichô慶長and the immediately following Genna 元和 eras are specifically called Keichô Shintô 慶長新刀. Shintô 新刀 not only denotes new swords, but it also points to the fact that the nature of the sword smiths, their workmanship, the iron material, and the forging technology all drastically differed from the Kotô 古刀 times. The swords produced in this period gained a shape considerably different from earlier works. The Sugata 姿 had a normal width, remarkably shallow Sori 反り (curvature), and a marked tapering towards the point. The Kissaki 鋒先 was medium sized, and the overall length measured around 69 cm. This type of structure can be seen most in swords produced around the Kambun 寛文 and Empô 延寳 eras, and is classified as Kambun-Shintô 寛文新刀. The Dai-shô Koshirae 大小拵 (a pair of large and small mountings) that began to be made in the Momoyama period 桃山時代 became an object of official regulation. 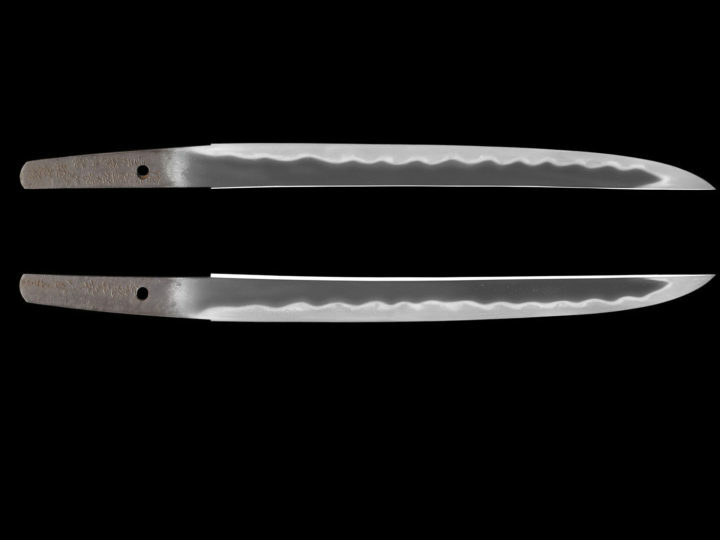 The Wakizashi 脇指 were used as the Shô 小 of a pair, and were made in length around 48 ~ 51 cm. Few Tantô 短刀 were produced in this period. After the Genna era 元和, the peaceful nation’s state gave the Katana 刀 a different function, and its appearance became more significant than its practical quality. Tsuda Sukehiro 津田助廣 based in Ôsaka 大阪 innovated Tôran-ba 濤乱刃 (depicting large surging waves), which was the most popular sword fashion at that time. Further, the engraving in the blade surface, which originally started as an object of faith, became simply ornamental and resulted in many decorative designs. In addition to Sukehiro 助廣 in Ôsaka 大阪, Inoue Shinkai 井上真改in Ôsaka 大阪,and Nagasone Kotetsu 長曾禰虎徹 in Edo 江戸 were the most famous sword makers. They created unique and refined temper patterns such as Kotetsu’s 虎徹 Juzu-ba 数刃 (Gunome 互の目 regularly formed to look like a chain of beads). At the end of the Tokugawa Shôgunate 徳川幕府 rule, together with the on-going revival movement, the power struggle between the local rulers supporting the vying Tokugawa 徳川 and the Imperial families coupled with the threat of foreign invasions, the nation was at great risk. Reflecting the overwhelming instability, the Katana 刀 became wide and long, had a large Kissaki 鋒先 to form a sturdy and fierce structure. They were subject to mass production. Katana 刀 from this time are called Shin-Shintô 新々刀. There is no doubt that the changes in the Sugata 姿 of Nippon-tô 日本刀 basically resulted from the changes in the style of battle. However, the specific changes in the battle styles and their exact impact on the blade structure yet require further research. NOTE: This article has been reproduced with the kind permission of Tanobe, Michihiro Sensei.